This article on testing was reproduced from the educational archives of Yuri’s Sample Rate Converter website with his kind permissions. All copyright belongs to said website and any reproduction of this information below can only be done with the express permission of Yuri Korzunov. This feature is also part 1 of a two-part series on DSD audio. The second part next Friday will focus more on the shared commonalities between DSD and PCM audio formats. Most likely you will already have heard about DSD or used the file format for listening to music on your audio devices such as digital media players or desktop media servers. However, in this article, we will try and clear up any misconceptions you have about what DSD actually is and how it differs at a very basic level to PCM. 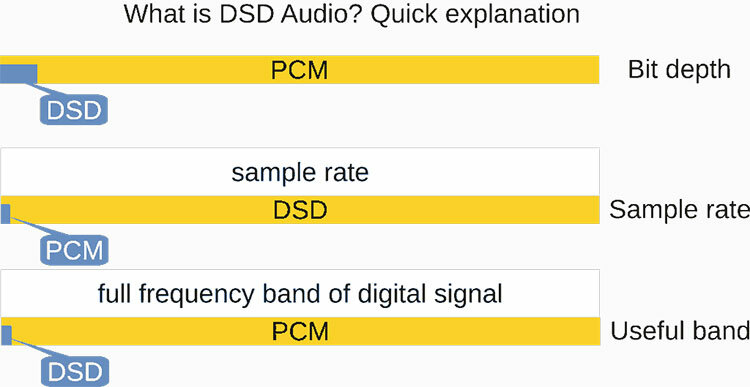 We will go through the essential points covering the principles of the DSD audio format including; what is actually inside a DSD and PCM digital audio conversion and why it is not easy to compare DSD and PCM. One of the first digital formats was the Audio CD optical disk (PCM modulation / PCM format). It was a source that delivered low distortion and noise levels compared with analog equivalents such as cassette tapes and vinyl records. A whole generation since then has grown up with a much higher level of expectation in terms of how audio should sound. We shall negate the whole topic of the recent ‘hipster revival’ of vinyl sales for now. I still think the vast majority of people have forgotten what “real analog noise” actually sounds like. 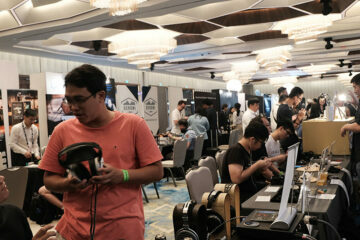 After the birth of the CD, the demand for ever-improving sound quality could be implemented by increasing either the sample rate or the bit depth of a digital recording. Audio quality is determined by the level of noise and distortions that is derived from either the encoded format, the chosen the software used, or the equipment at hand. The level of audio quality may be normalized by certain psycho-acoustic criteria. However, Sony and Phillips decided to use another kind of modulation called 1-bit sigma-delta modulation. For further reading on what exactly sigma-delta module is and how came to be, I highly recommend Chapter 2 of “Look-Ahead Based Sigma-Delta Modulation” by E Jansen & A Van Roermund (Springer Edition, 2011). You can find the PDF link here. At first glance, using 1-bit is impossible, because such bit resolution (bit depth) causes huge noise levels. However, if high sample rates are used, the noise energy may be pushed out of our audible frequency range (to ultrasound). That action is called “noise shaping”. Practically, 1-bit conception may be easier, than multi-bit, in a DAC implementation. When DSD is converted to analog, ultrasound noise is filtered. Mediums that contains 1-bit DSD audio streams was previously referred to as SACD (Super Audio CD). The Bit depth of a sample audio defines the level of audible noise. The greater the bit depth the lower the level of audible noise. In the picture, we can see that the bit depth decrease is achieved by using only part of the full signal frequency band. In other words, if we want to reduce bit depth, we must increase the sample rate to keep the audible noise level. Below is a snapshot of some the key differences between the digital audio formats currently in commercial use today. Note: WAV and FLAC formats are both PCM implementations. To providing a greater level of PCM decoding precision into this kind of DAC, a digital sigma-delta modulator is used. Post-modulator another sigma-delta component, this time a demodulator, is used to convert the digital “DSD” to an analog signal. The latest generations of DAC’s can now accept and natively decode a DSD sample. In these cases, a DSD DAC is much simpler in operation. It contains sigma-delta de-modulator only and does not require a demodulation process. It is technically impossible to compare PCM and DSD DACs because they use different processing / electrical circuits as shown above. 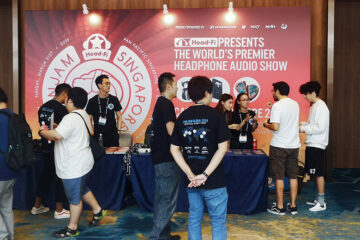 Is DSD sound quality better than PCM? Technically, DSD and PCM are incomparable. Even if a single DSD/PCM compatible DAC is used for testing differences in outcome or quality may be caused by different mixing/post-production of records and the DAC deploying different internal circuits to decode the signal. The general answer should be; “Each case is individual and will depend on the playback system implementation and listened recording”. Is native DSD audio editing possible? DSD editing is cutting, merging, gain altering, equalizing, etc. of file(s). “Native editing” (without conversion to multi-bit and DSD re-modulation) is possible for cutting and merging of DSD records only. All other kinds of the editing demand conversion to multi-bit values and re-modulation. In this case, loses in the editing in itself is comparable with PCM re-sampling. DSD (SACD) appeared as an improvement to CD-audio. Sound quality is not a DSD/PCM format matter but instead depends on the implementation and quality of a musical recording. “Native” DSD editing is possible for limited cases. For other cases, the loses make it comparable with PCM re-sampling. Kind of shocked by this article. Digital music, all things equal – and I don’t care about bits and sampling rates and demodulation or hiss or noise levels or any other nonsense – will never sound ‘better’ than analogue. With the right equipment and a clean record analogue “sounds” better because it is a complete signal, where digital is sampled. Period. You cannot judge audio equipment by looking at specifications, they simply do not tell the whole story. You are right about specification. Bounding between figures and subjective impression is not so simple. Because there are many variables. There are not any mystique. All these things may be objectively researched and measured. And we (developers) can use fugures to detect right improving direction. Analog mediums are nightmare for developers. Because there are so significant distortions comparing digital ones. However, subjectively distorted signals may sound better, than purer signals. But it is not matter of better sound quality. It is matter of art. Theoretically, we can model analog signal (its distortions) from digital one and get same sound. But we can’t create purer digital signal from analog one. 1. You are right about specification. There are many variables. And bounding between subjective impression and objective figures is complex enough. However, figures need for development to detect right improvement direction. Also for more exact equipment estimation, need more figures than published in available specification. Example: THD as itself say almost nothing about sound quality. Here need more information about spectral content of the distortions for all input frequencies. 2. Analog sound is more distorted than digital one. Theoretically, we can create “analog” sound from digital stuff. But we can’t create purer digital signal from analog source. How is digital not a ‘complete signal’? Digital recording creates a blueprint of the music/electrical signal input and then rebuilds it on playback. If done correctly it is capable of more accurate capture of music. DSD is not type of DRM (Digital Right Management). DRM is kind encrypting of digital audio content to copying protection. DSD is kind of digital signal modulation. It is not encrypted information. There is not copy/demodulation protection. DSD is one of implementations of sigma delta modulation. 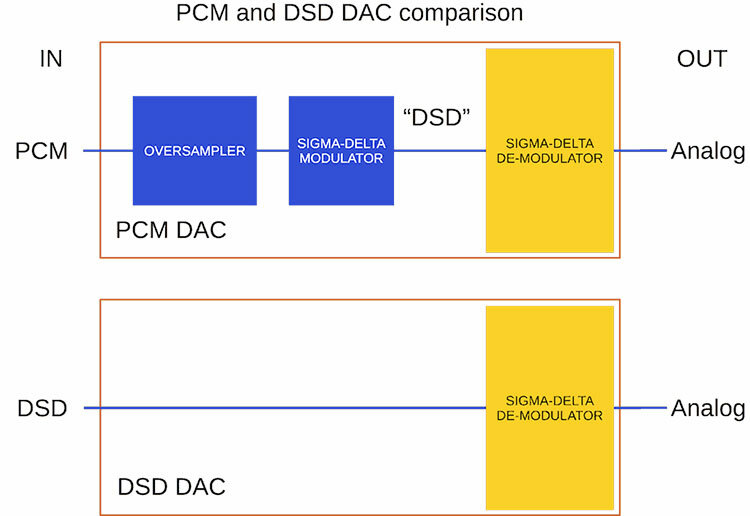 And DSD is converted to PCM or analog via usual sigma-delta demodulator.